Daniel was born with a defect that caused his appearance to be slightly animalistic, having wild hair on most parts of his body. His eyes also have a disease which caused their unusual colour (a deep, blood red) and gave him slitted pupils. Daniel also suffers vision problems due to the disease, which include being colour-blind, far-sighted, having little to no night-vision, and being unable to read small print. However, this has made his senses of hearing and smell much stronger. He can catch the slightest whiff of a wealthy woman's perfume, or even the smallest spill of oil. His mother works in a successful flower shop, though he feels a bit melancholy whenever he goes in. While he may be able to smell the blooms more clearly than others, it upsets him that they all look grey, black, and white. He felt the same about his inventions, which were also brightly coloured, and a joy for most other people to gaze upon. 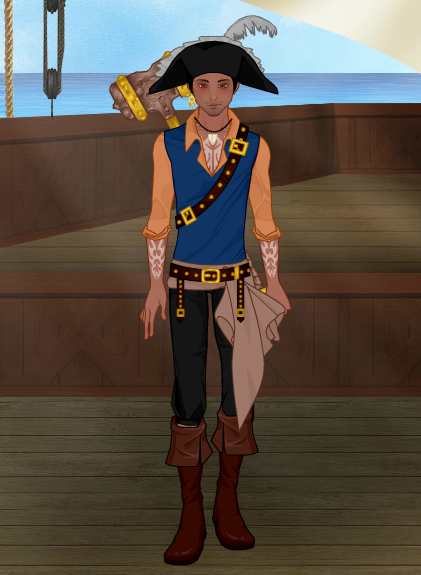 Finally, he became frustrated enough with his cursed vision issues and ran away from home to become a pirate; at least that way, he would be able to get the funds to pay for a doctor to fix his problem. Daniel, despite wanting the money desperately, cannot steal from those whom actually need what money they have. He has too kind a heart for that. His crew have also been instructed in his mindset, and most of them have no problems with it. However, Daniel takes no issue with stealing from the wealthy merchants or elite class members who happen to cross his path on the sea. He never harms anyone if he can help it, and he has ordered his crew never to bring harm to anyone unless absolutely necessary.